So here is my 1998 Superhawk! That was a little under a month ago...this is where we stand 23 days later. -Completely repainted all body pieces, and helmet. -Chome screws for all body piece attachments. I plan to do more....if anyone has any suggestions on mechanical things, or upgrades to performance of the bike, it would be highly appreciated. PLEASE, let me know. Like I said Im new to bikes and a do it yourselfer so Ive just been using the repair manual, and reading helpful (life saving lol) posts from the cool members of this forum to get things done. Id be lost if it hadnt been for some of you out there so thanks! Come back and see it when its done! Wow you are exactly right cuz "I want to know why you would do something like that to a superhawk"? I am a true simpsons fan since its start on Tracy A(U)lman but this leaves me as offended as Australia after the fraudulent collect call. I'm not saying this is a bootable offense but......."Here in America we dont tolerate that kind of crap sir"
This will be a show bike for entering in car/bike shows. When Im done with it, it will be the sickest hawk ever! If its not already that from what I've seen. But everyone has their own style. Do what makes you happy, you build it for yourself not others. Best upgrades for sure is the suspension and brakes after that it all comes down to personal taste and looks. Have fun building and adding to your bike, it is hands down the funnest bike to ride out there. Good work! but I don't see anything that screams "the simpsons" yet. Are you going to get characters faces painted on or something? a bunch of strawberry frosted sprinkle covered donuts everywhere? 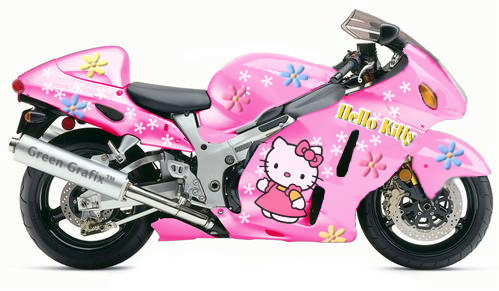 Just for public knowledge, is this a chick's bike? No way am I the only one wondering. Maniac2313...can i please see pics of your bike? Ill throw 10,000 dollars into this bike in one week, wreck it, trash it and not blink an eye. Whatevers been done, I can do. Faster and better. Clearly this person has loads of money. GL with the build man. Search around for HID projectors, lots of discussions on why just throwing an HID bulb in a stock housing is a poor idea. For a show bike, you may not care, but to use it on the road you may want to go with a projector. IMO looks cooler in there anyway. Wow that thing is UGLY!! 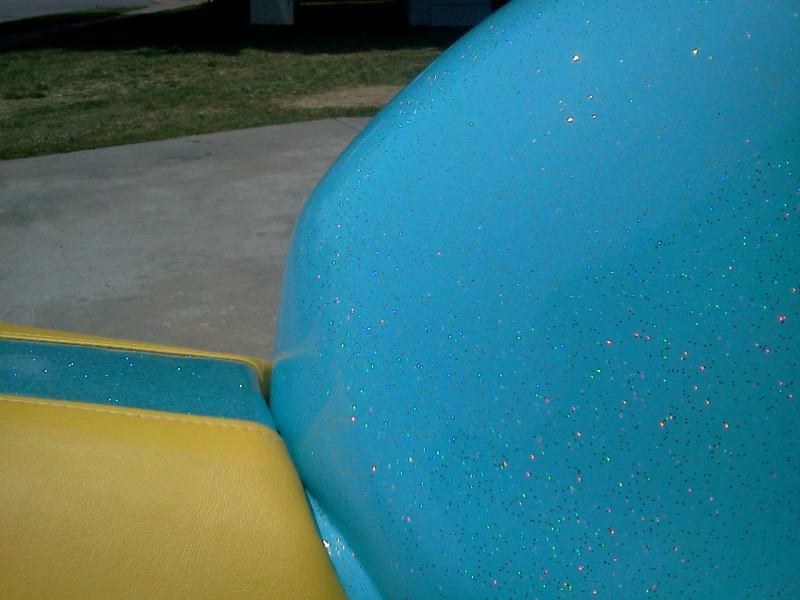 But the blue is better than the previous green. I think it'll get a lot of attention at the shows but not so sure the kind you want. Maybe a lot of pointing and laughing. By all means I think it's cool you're making your bike how you like it, and it will be "SEEN." Just like I said I don't think it's the kind of being "SEEN" that you're going for. 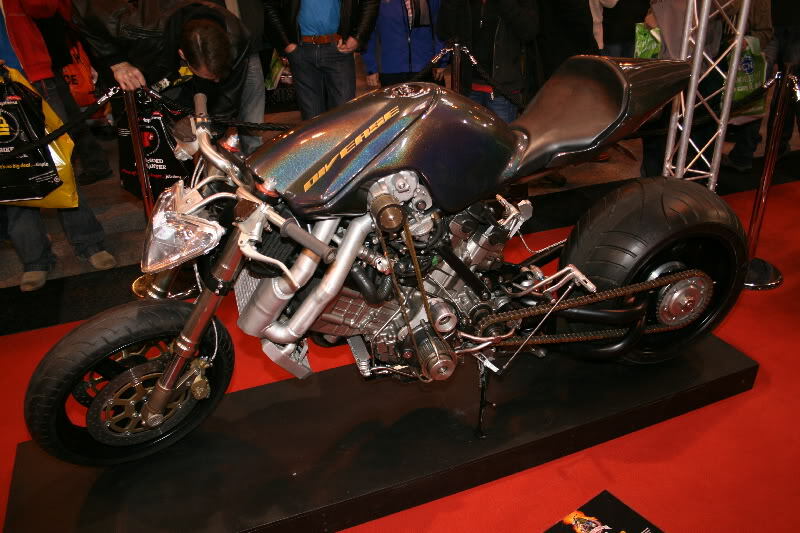 7, on the other hand that turboed VTR is kind of sick! I'm not a huge fan of the cosmetics of it but I'd love to throw a turbo like that on mine! LOL! 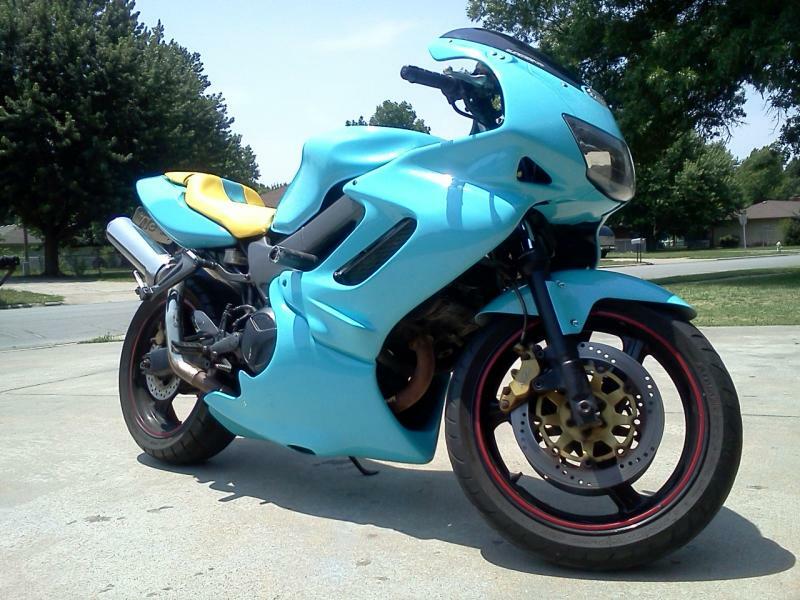 Ill throw 10,000 dollars into this bike in one week, wreck it, trash it and not blink an eye. Whatevers been done, I can do. Faster and better. But to each his own, though you might want to tone it down just a touch if you want to get help around here. Wow so is that thing turbocharged and supercharged? I wonder what all they had to do to the internals to keep it holding together such a stronger rods etc. It looks more like they just took a VTR engine and built everything around it. I don't see anything else that's stock VTR other than the engine itself! 7moore7...i retract my statement of the sickest (spoke too soon lol)....that first pink and yellow one you posted is SICK!!!! 8451Hawk...sorry bout the ego thing lol. Im just a person who doesnt judge others' style and respects what others like to do with their property. So its just irratating when people talk crap cause thats something I just dont do to others. [QUOTE=spitfirerecords21;334177]Maniac2313...can i please see pics of your bike? 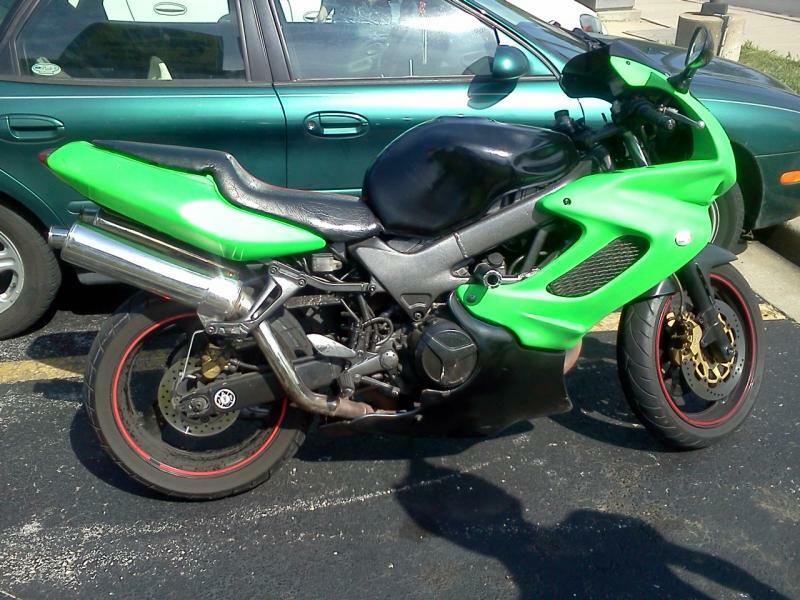 Ill throw 10,000 dollars into this bike in one week, wreck it, trash it and not blink an eye. Whatevers been done, I can do. Faster and better. I'd like to know where you got the Mori cams and O/S valves as I am putting together an engine package for the winter project. Yeah, its yours. You can do what you want. But you did post it on a forum with guys who have spent hundreds of hours working on their bikes and made wacky claims of it being sickest (which it may be but for the wrong reasons). 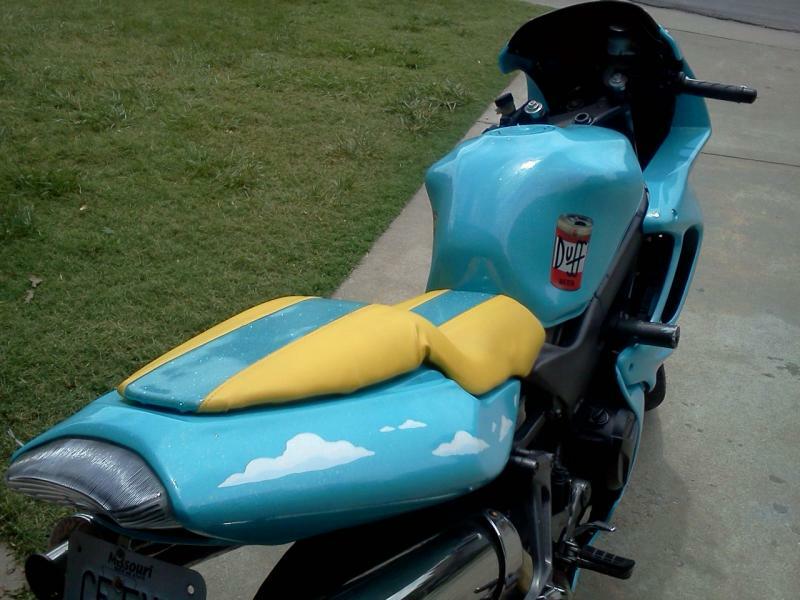 If you thought you'd get applauded for turn signals and a zany paint job... Well good luck. I have spent far to much time wrenching, riding and racing bikes to respect it. BTW this is nice and tame compared to what I would say in person. Trying to be polite. Im done arguing with internet thugs so kill that. Talk big to me in person I'll blow yo brains on the pavement...literally...F**k what u heard! Dude your posts are confusing... what are you talking about? Blow his brains out for not liking your bike? Does he have to like it? How will you know what he looks like in person? Or will you just be super pissed at everyone who doesn't like your bike? You even mention that some people might ask why you would do that to a bike... if you go through s-joe's posts, you'll know that pretty much anything that doesn't help the performance of the bike or make it safer for all the miles he commutes doesn't impress him. So its just irratating when people talk crap cause thats something I just dont do to others. Wow, I was always told people fro m the Midwest were all polite and respectful I guess he's really good at killing stereotypes as well as people! I'm still lost on him dumping 10 g's into his bike just to dump it and walk off. Yeah, you're awesome. Way to have zero respect for what you have. If you actually put any work into it, you wouldn't let anyone get within 10 feet of it. I couldn't care less what people say about my bike. I did my work not to make it look flashy, but to where I can respect it and my work. It's something I'm proud of. It seems like you have that part kind of figured out, but you still don't have any respect for it, which just means that you want people to notice it. 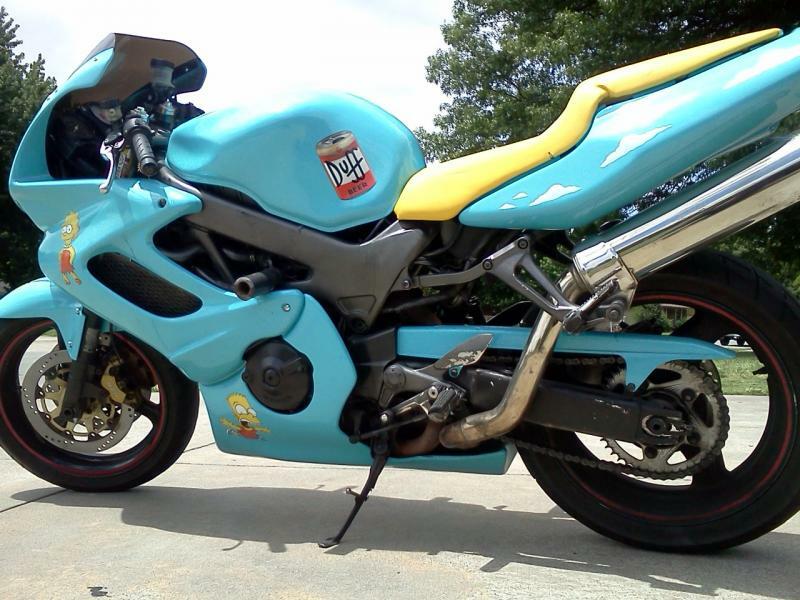 And I know I missed the boat on the badass bikes that have been posted on here before, such as tweety's and mkstr's bike. I just have to add Mdbuehler to that list with his beautiful bike and of course Sparxxx's HRC naked bike, which is one of the most amazing naked bikes i've seen, as well as 7moore7's naked, I didn't forget =p. There are a lot of people on here that can teach you amazing things about this bike and give you a new found respect for it. Some of these people have dumped their lives into their bikes, and could list off every single piece they have on there with the date and time that they got it. You're acting like a child. Leave that kind of showboating and mindset to the R6 riders. There's a reason I have Noble across my bike. I'm not just proud of what it is, but I'm proud of all the people on here that took their time to learn this bike and spread that knowledge to anyone else who's willing to listen. Shut your mouth and open your eyes, It's time to learn Kid. Last edited by maniac2313; 06-07-2012 at 06:19 AM. 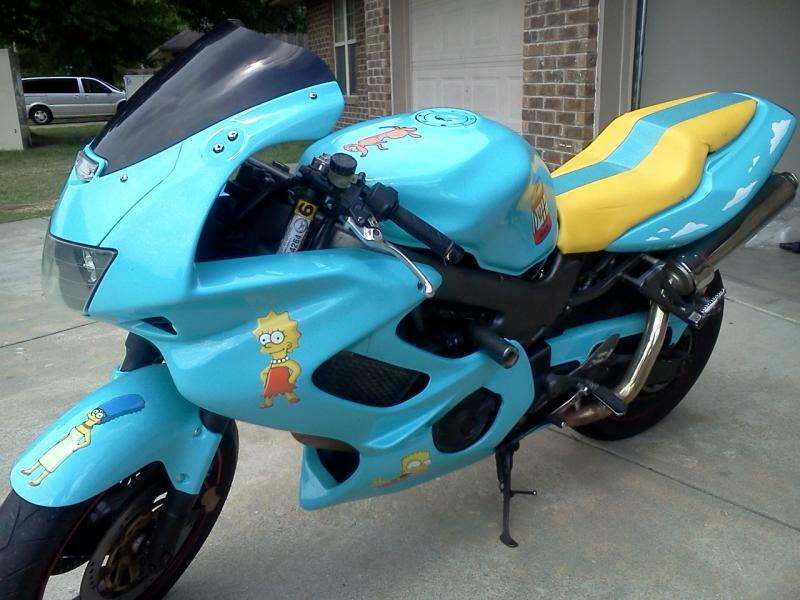 If you think your ride is so sick....wait until I build my "Family Guy" theme bike...."Victory will be mine!!!" Quick Reply: "THE SIMPSONS" HAWK?? ?